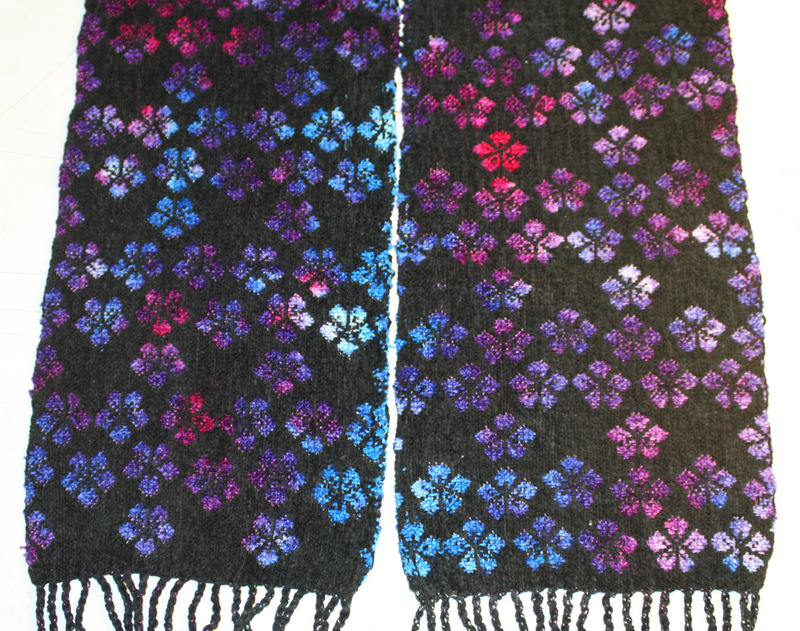 You are here: Home / All blog posts / Handwoven article, and finished scarf! 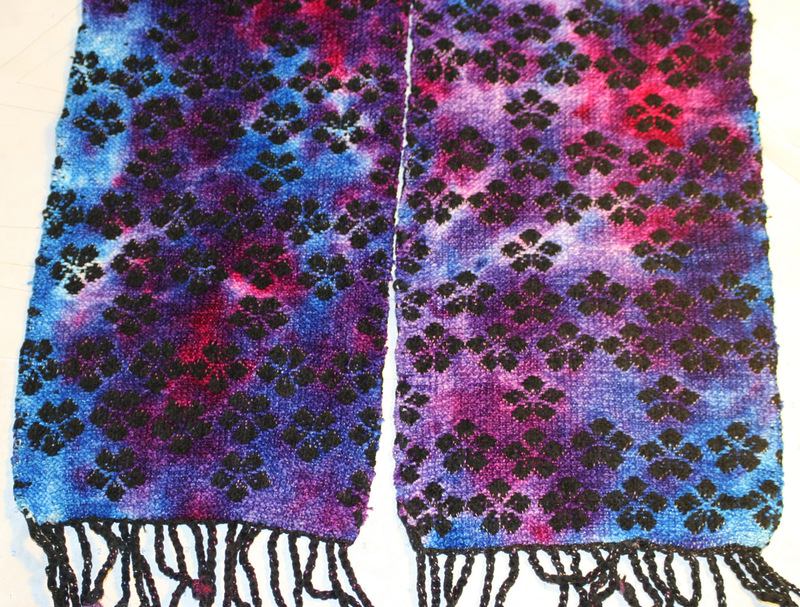 Handwoven article, and finished scarf! The new Handwoven is out!Â If you haven’t gotten it yet, the article about my dress (a half-pager) is on page 29.Â Woo hoo! I like it!Â I think the colors are maybe a little too dark (it’s darker in real life), and I think the flame colors of the previous sample stand out better, but these colors suit the intended recipient a lot better than orange would! The scarf is a little narrower and not as soft as the other sample, probably because I was a bit harsher in washing out the dye.Â It shrank from 12 x 83 inches in the reed/on the loom to 8.5 x 73 inches, so there’s only about 12% shrinkage in the length but a bit over 25% in the width.Â I conclude from this that the rayon chenille shrinks a lot more than the cotton! Anyway, this is giving me time to reconsider what I want to do.Â It’s been suggested to me that chenille may not be the best choice for a frequently-worn, frequently-washed garment.Â I don’t know enough about chenille to know for sure (I’ve never worked with it), but this may prove to be a deal-killer for the chenille bathrobe.Â It’s also becoming clearer to me that I want something more elegant than a conventional bathrobe.Â Perhaps a kimono robe, perhaps something more fitted and stylish – but then I couldn’t throw it on over a T-shirt, and I’d feel bad about wearing it while doing the laundry (etc. ).Â So the mix is still evolving. I am pretty sure I want to weave up chenille yardage in diversified plain weave, though, because I think it’s an interesting weave structure and because I’m enjoying working with the chenille.Â The question is, what does one do with the yardage?Â I’m having lunch with Sharon (the seamstress I worked with on the dress) in about two weeks, so I think I’ll bring her a sample and ask for her thoughts.Â Meanwhile I will continue weaving samples in different weights.Â That should keep me busy for at least the first week or two of January. I’m also working on my presentation for Black Sheep Guild.Â I’m pretty close to finishing the content of the presentation, and now need to practice delivering it once or twice to make sure it fits in the time allotted.Â Â After that, I’ll start working on making the slides pretty.Â I think I will do a different handwoven fabric as the background for each slide (if I’ve actually woven enough suitable cloth to do that! ), to add some visual interest. Tien, you might want to have a look at the yarns offered (wholesale) by Henry’s Attic in upstate New York. Mostly all undyed, many cottons and cotton blends, wonderful textures, wide range of weights/grists, excellent quality. Many retail shops carry a portion of the HA line, and most would be willing to special order one they don’t actually carry. And a happy Christmas to you! One of the members of my weaving guild has a very comfy jacket made from handwoven rayon chenille fabric. She had to reinforce the seams when they quickly showed signs of stress but after that the jacket appears to be wearing well, I see it at least twice a year. If you would like I could ask her at our guild meeting in February.